Possibly the single most important factor to maintaining your air conditioning unit is keeping it clean and well maintained. Not only will good maintenance reduce your energy consumption and save on your monthly bills, but clean condenser coils will make your A/C unit last longer and keep it running efficiently. You can also read “How To Clean Central A/C Evaporator Coils” Here. There are different types of air conditioning units but for the purpose of this article, we’ll be talking about a central air split unit system.They are most common in the Dallas area and can be found all around the country. A split system comprises the inside unit, which contains the evaporator, located inside a central duct attached to your furnace/blower within the house and the compressor/condenser unit that sits alongside the exterior of the house. You can click on any of the images on this page for a larger one if you want as well. 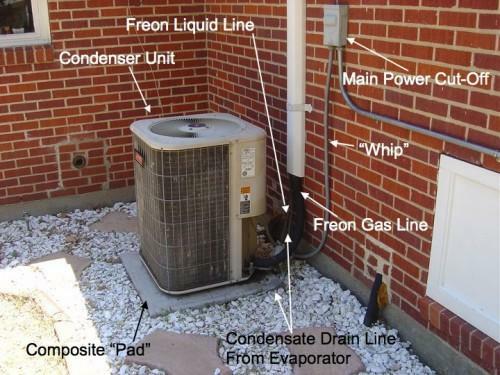 Shown above are the primary components of the outside condenser unit of a split unit central air conditioning system. How Often And How Long Does It Take To Clean Your Unit? Cleaning the compressor coils and cooling fins of your outdoor unit once per year is recommended under normal conditions, but more often if there is a lot of growth around the unit or cottonwood trees or dandelions nearby. These are clogging culprits. For comfort and cost savings, this ranks as the top regular chore you can perform yourself on your air conditioning unit. For this project you will need a garden hose, a good *spray-on foaming cleaner and a *cooling fin comb if the fins are badly bent. Basic tools like a wrench or screwdriver will be required to remove the A/C unit cover. You will also want a shop-vac and a medium stiff brush (but be very careful when cleaning cooling fins, they are very fragile and can bend easily. This unit has not been cleaned in at least 2 years. You can see a lot of dead grass clogging the fins. Cleaning just the outdoor unit will probably take an hour or more if it’s your first time, so allow yourself enough time to do a good job. If you aren’t up for the task, you can hire an HVAC professional to do it for you. They will clean your outdoor and indoor units, check your freon level and make recommendations for you anywhere from about $69 (“special” or promotional) to around $150 for a general upkeep cleaning. Most companies run spring and summer “specials” because they know most units will need charging with freon or other work. This is still a good route to go if you want to watch a pro do it first, if you suspect that you are low on freon or have a specific problem or questions you need answered. You can also purchase a bi-yearly maintenance contract, which can save you money and make maintenance automatic. Or, you can easily learn to do-it-yourself. Before I do anything, I always make sure the thermostat is set to “off”. Then I remove the main power switch located inside the master switch panel. The master switch is almost always attached to the house at the same location as the unit itself; simply open the panel and pull out the large plug. Once the power has been shut off, you should remove as much debris, growth and lawn clippings from the outside of the unit that might inhibit the flow of air as possible. Remove the top of the unit. There are typically hex-head bolts or screws that you can see on the top of the unit or on the side at the top. Be careful! The fan motor is usually attached to the top of the unit and you don’t want to bend the blades or damage it. Have someone hold the top of the unit or lean it carefully aside, making sure not to rest it on the fan blades or stretch the wiring. You can easily clean out the bottom of the inside of the unit with a shop vac. You never know what you’ll find inside! You may need to evict a rodent or snake, but most of the time you just need to clean out the dirt, leaves and dead grass. Then, use a brush attachment on your portable vacuum and carefully vacuum the fins. Carefully vacuum the crud off of the fins. Use an up and down motion. Don’t vacuum acroos the fins, you’ll probably bend them. After vacuuming the fins, spray the outside of the fins with a good coil cleaner and wait 5 minutes. A mild detergent/water mixture works well too. Then simply use a garden hose to spray, from the inside to the outside of the unit until the water comes through nice and clean all the way around. If your unit does not come apart, spray to avoid the fan motor as much as possible. Either way, avoid directly spraying the compressor. If you just can’t resist it, and you spray the outside of the unit, be careful not to bend the fins that surround the coil with pressurized water! Spraying the outside of the unit isn’t recommended, since you will either get excessive water inside the unit or lodge dirt and particles deeper into the fins, or both. You can rest the cover (the part that you removed earlier with the fan motor attached) on top of the unit for the next step: Using a cooling fin comb, work the fins carefully to clean and straighten them if they are badly bent. If there are a lot of bent fins, this could take some time. Cooling fin combs are not easy to work with but the ability of your cooling fins to dissipate heat is very important to the performance of your unit, so it’s definitely worth spending the energy it takes to straighten any bent fins you have as much as you can. You can easily figure out how many teeth you need on your fin comb by simply using a tape measure and counting the number of fins there are to an inch. That is the “tooth-count” you should buy for your fin straightening comb. Most fin combs have 4 different tooth count combs. Finally, reverse the dis-assembly steps by re-attaching the top of the unit in the same way it came off. Then, plug your main cutoff back in, then go inside and turn your thermostat to the “cool” position and lower the temperature setting enough to make the unit come on. Many units have a timing mechanism that delays the unit from coming on for a few minutes. Go back outside and listen for any odd noises (once the unit is back on) to double check everything and that you re-assembled everything correctly. If you hear something out of the ordinary and don’t know what it is right away, then I recommend calling a professional to come and check out your system for you. (above): This is about how the unit should look after your done. 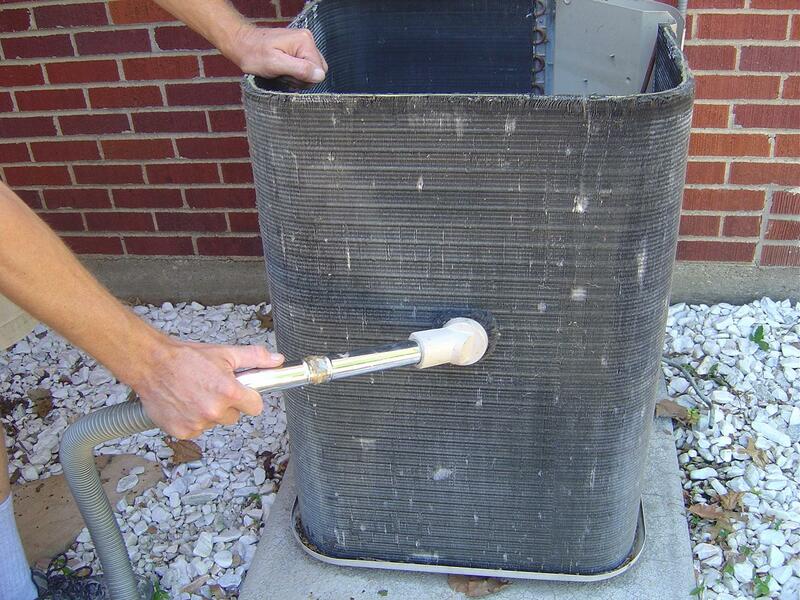 Tips: Clean your air conditioner condenser early in the spring. Most A/C companies are busy all summer repairing and replacing units and you may have to wait before someone comes out or have to pay a premium. While the unit is open, look closely at the bottom of the unit for dark oil spots near the compressor. If they are present, you may have an oil leak from the compressor and your system may need to be repaired and charged with freon. Have a professional come out and take a look. Visually inspect the large flexible conduit that comes from the unit to the main cutoff for breaks. This is known as the whip. If it’s broken or damaged, it should be replaced. Inspect the insulation around the pipe that goes to your indoor unit. Although it is arguable that this piece of pipe insulation has little true function, it is good for aesthetics and it helps protect the pipe. Replace it if it’s worn. Do not attempt to replace the “pad” that the unit sits on. There are so many fragile parts that you will probably only be asking for trouble. If your pad is broken or sinking, consult a pro. They will usually tell you to wait until the compressor needs replacement before changing it out for a new one. A good cleaning brush for cooling fins is a toilet bowl brush. Just remember to be very careful when brushing the very fragile cooling fins. Now is also a good time to replace the filter at your blower or return duct, indoors. They cost a couple of bucks or less. A note about filters…there is no such thing as a 60-day or 90-day filter. Change your filter every thirty days. You can probably find a handyman to do this sort of air conditioning maintenance as well, for probably less than an A/C specialist will charge. A handyman without an HVAC license cannot charge a system with freon or attach a pressure guage, so be aware of that. So that’s it! I hope these instructions were enough to get you out there. It’s not difficult to do and it will save you a lot of cash in the long run.